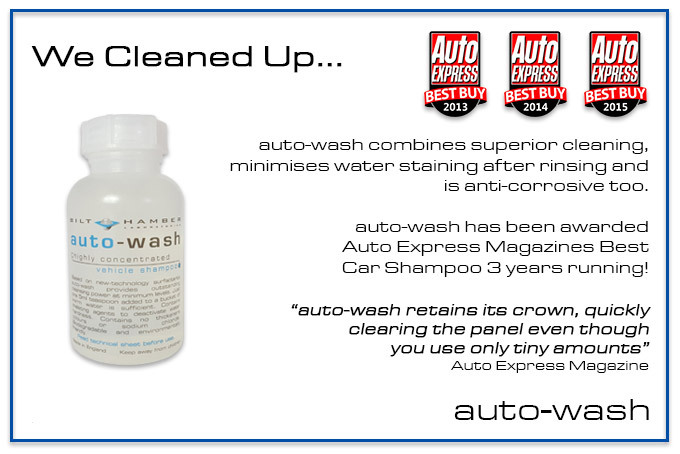 auto-wash is a new technology, highly powerful and environmentally friendly car wash shampoo. It also contains anti corrosive properties. Bilt-Hamber Auto-wash is a new technology, highly powerful, environmentally friendly vehicle shampoo, formulated and manufactured to allow you to effortlessly, gently and effectively clean your paintwork before waxing with our highly acclaimed Auto-balm. Auto-wash is anti-corrosive to bare steel too, ideal for owners of older vehicles which may have stone chips or exposed areas of mild steel. The highly concentrated formula means that less is needed to add to your water. Not only do you save money, but the added benefit of this is simple - there is less matter to remove from your paintwork prior to polishing. Our Auto-wash will chamois off with ease to leave a perfectly clean body ready for further treatment. In fact, as a single shampoo can be carried out with just a single teaspoon, one wash will cost you less than 11 pence. 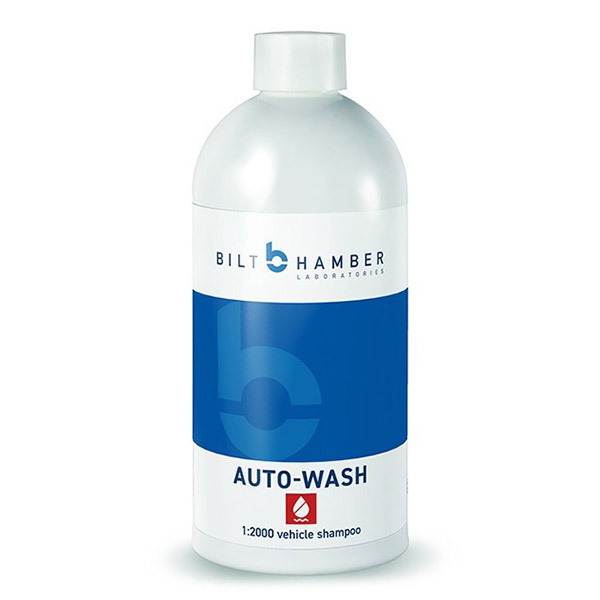 Bilt-Hamber Auto-wash uses powerful surfactants to create a high foam level. This simply means that particulate matter is lifted away from the paint, where it can be safely removed with reduced risk of scratching or damage to your car's paintwork; essential we think, for older vehicles and bikes with delicate paint. ▶ Class-leading long-term protection on steel. ▶ Will chamois off with effortless ease. ▶ Gently lifts dirt away from older paintwork first. ▶ 60 washes from one bottle. ▶ Use as part of the Bilt-Hamber 'Perfection' range. ▶ Supplied in a durable aluminium container. Autowash is a highly concentrated - just a 5millilitre spoon full (1 teaspoon) is sufficient. Its low viscosity ensures it pours easily - the measured amount should be emptied into a clean bucket before adding the warm water thus generating a thick lather for paintwork cleaning. Autowash can be used neat as a pre-wash spot cleaner using a clean swab for removal of very stubborn oily films. There's definitely something in it that makes it better than the rest, on my first wash I thought it was just normal but then on its like you've polished as well after washing Very happy!!!! Bought this to try was gob smacked by how good it is, even my audi dealer wanted to know what I used to wash it! Would recommend it 100% it is well worth the money. Keep up good work at Bilt Hamber. I used this product for the first time on 4/3/15, what a product the best I have ever used congratulations. After lurking many forums, I made the decision to try out Auto-Wash. Waited 2 weeks before washing, so it had plenty of dirt, grime, bugs and tree sap on it (lots of trees round my house) and the odd pigeon. Also the color is a light pearl white. So dirt shows up easily and is very noticeable. Using the 2 bucket system and a proper washing mitt. Filled a 12 liter bucket and added a teaspoon of Auto-Wash. At first i found the foam to be lacking. Maybe i need to add more?. I soon understood that, even when there was little foam production, the cleaning power is superb (and that from a teaspoon of wash . . . .) Tree sap came off after a couple of swipes, dirt came free without effort and bugs got washed away. There where a few dirt spots left, but the paint needs a clay. The Auto-Wash did a amazing job compared to other products i have used. And since the color is a slight pearl white, i am very pleased about that. Found a product here that i will stick to and hopefully convince others to try it out. So price/performance is bang on. Good job B-H.
Bought this because of reviews on other sites. Managed to clean my VW Caddy Maxi with one bucket and a 5ml dose of auto wash. The suds didnt last too long but it kept on cleaning very well all the same. Given how often l clean the van the bottle will last a couple of years so works out to be very economical to use. Well worth the money. I bought the special offer of auto-wash, cleaner, clay-bar and auto-balm. My car looks fantastic and I used the cleaner to clean all my PVC outside my house. Very good products and I will recommend to everybody, thanks! Used this to clean car today and the results are fantastic. live in a fairly hard water area and after washing no water marks and the finish is like a mirror. Car looks as day I bought it. Many car washes just quickly lose their suds, as soon as you start to wash the car, as the surface contaminants, and old wax kills suds. This one does not. It only requires a small amount and does a terrific job. The best and anti corrosive. I bought this car wash after reading the many happy reviews. I was sceptical at the tiny amount required however I must say I was impressed. I used it with BiltHamber wash mitt which i also found excellent. It left the car streak free and even gave a beading effect to the paint. I would definitely recommend these product. After using other B.H. products with great success, I thought I'd give Auto-Wash a try. It works better than both the previous car wash products I'd been using in the past. As others have noted, the suds don't last that long but obviously it's not that important because the product works effortlessly. I use a large bucket with grit guard and a decent quality wash mitt. With the A.W. dirt literally just wipes away, even potentially stubborn birds mess is no problem. Although it isn't important, the product even smells nice as well as doing a superb job of cleaning. I would highly recommend this along with Auto-Wheel cleaner to anyone. If like me you take pride in doing a decent job when washing your car then give these a try. Excellent value and most importantly, really good products. Well done Bilt Hamber. This shampoo is truely astounding! You use such a small amount and it explodes into tons off bubbles! Bubbles that clean very well I must say! A must have car shampoo in my opinion! .No surprise to read that this is the mutts nuts, this product is jaw droppingly good. I slipped when pouring the bottle and ended up using more than the recommended amount but my word the cars (I cleaned two with the two bucket method as it was cleaning so effectively given the higher concentration) are still clean and gleaming after a couple of hundred mile plus journeys in wet n wild weather. Staggering and far superior to anything else.